Dishonored 2 will have a quick save & load system and will feature unique assassination targets for each of its dual protagonists, according to game director Harvey Smith. Keep an eye on the rooftops and check out our list of upcoming PC games. In an interview in the latest issue of Game Informer, Harvey Smith talks about how Arkane aren’t afraid of challenging industry trends and carving out their own path. As well as letting you play as original protagonist Corvo Attano – who now has a voice, by the way – you can also choose to play through as Emily Kaldwin, the daughter of the Empress who’s now all grown up. Not only will the two characters have abilities unique to them, but they will also have some different assassination targets and they’ll react differently to the story throughout. Presumably this is on top of how morality plays into, and alters, the story. So, essentially, Dishonored 2 is multiple games and will require at least two playthroughs to see the full story. It’s a potentially risky move, as many players will only see some it, but Harvey Smith says Arkane aren’t worried about doing something different. “If you make all your decisions based on what you think is selling well, you end up with this kind of indistinct mess,” Smith says. “Whereas if you go with what is in your heart as a gamer, that’s kind of how we think. It doesn’t make financial sense, but counter-intuitively, that’s how you get rewarded financially. 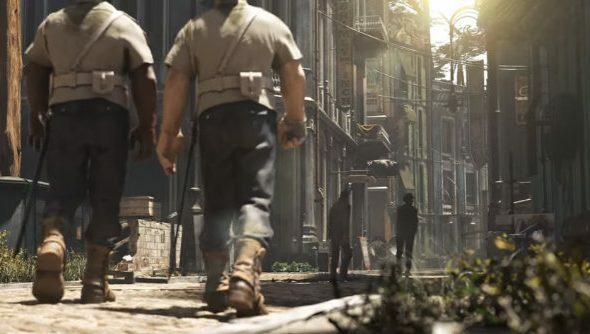 In other excellent Dishonored 2 news, the sequel will also feature a quick save and load system. Anyone who did a full stealth, no-kills, run of the first game will understand the game-changing importance of this addition. While Dishonored often feels like a game where it’s more fun to live with your mistakes – to adapt – quick saving and loading will make that inevitable attempt at a full ghost run that much less painful.